Below are some effective poison ivy remedies to relieve the itch and pain of a poison ivy rash. The best home remedy for poison ivy is prevention. Stay away from the stuff if at all possible. Remember the old saying” “Leaves of three, leave them be”. However, be aware that while poison ivy and oak have 3 leaves per cluster; poison sumac has 7 to 13 leaves on a branch. It normally has three leaflets (groups of leaves all on the same small stem coming off the larger main stem), but may vary from groups of three to nine. 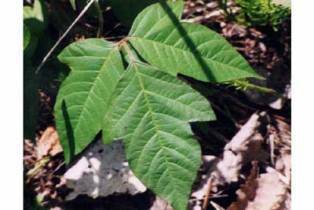 Note: Poison ivy and oak have 3 leaves per cluster; however, poison sumac has 7 to 13 leaves on a branch. Leaves are green in the summer and red in the fall. It is frequently found around lakes and streams in the Midwestern and the Eastern parts of the United States and is also commonly found growing along trails and roadsides. Poison ivy grows as a woody, rope like vine that can grow along fences or up trees, a trailing shrub on the ground, or a free-standing shrub. No, rubbing the poison ivy rash will not spread poison ivy to other parts of your body or to another person. You can only spread the rash, if urushiol oil (the sticky, resin-like substance that causes the rash) has been left on your hands. Direct contact is needed to release urusiol oil. You cannot get it just by walking by a plant; however, stay away from the smoke from a brush or forest fire as the oil can be airborne through the direst burning of poison ivy, oak, or sumac. (Note: The smoke from burning poison ivy can cause severe lung damage if inhaled.) The oil can also become airborne through a lawnmower, trimmer, etc. Be aware also that urushiol oil can stay active on any surface, including dead plants, for up to 5 years!. If you do come in contact with poison ivy, oak or sumac; immediately, rinse the contact area with cool water. However, be aware that you will only spread the oils around unless you use a lot of cold water! So if you are where you can’t rinse it very well, you probably are better off not pouring any water on it as you are taking a chance of spreading the oil over more of your skin. Remember the oil will usually bond with the skin as little as 15 minutes. 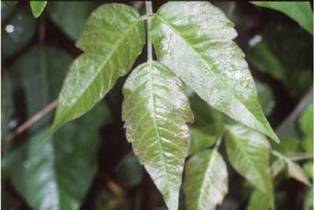 TREE TEA OIL: In my opinion the very best home remedy for poison ivy. Apply every 2 hours with a Q-tips or cotton balls. Can dilute with a little bit of water if needed. Will take the itch away and you should see improvement by the next morning. 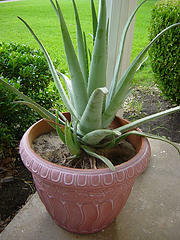 Cut off a part of the stem, then split it down the middle; rub it on gently several times a day and let dry. 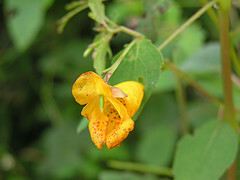 You can also boil the leaves, stems and flowers of a Jewelweed plant until the water turns a deep orange, and swab the affected area or apply as a compress. Many people say this is one of the most effective of all of the poison ivy remedies. HOT WATER: Another one of the good poison ivy remedies. You can use hot water for mild cases of poison ivy. The water needs to be hot enough to be a little uncomfortable but not hot enough to burn. It is supposed to take the itch away for a couple of hours. OATMEAL: Some good poison ivy remedies involve different ways to use oatmeal. One way is to make up some oatmeal, let it cool down to warm, and spread on the affected area. For cases where the whole body is affected, put three-quarters of a box in waist-high warm water in your bathtub and soak in it for awhile. Another bathtub method is to put the oatmeal in a sock and swirl it around in the bath water. Don't dry off when you get out, and the oatmeal will leave a powdery covering which will help stop the itch. Another home remedy for poison ivy is to make a paste using oatmeal and apply to affected areas. PLANTAIN: The common weed plantain, found along roadsides, meadows and frequently in people's lawns, may be used to stop the itch and control the spread of the inflammation. Crush the leaf and rub it on the affected area. The skin may take on a green tinge temporarily, but plantain works quickly. This herb has broad leaves (4-10" in length) and long flowered spikes. GOLDEN SEAL: Make a past out of goldenseal root powder and aloe vera gel. The golden seal will draw out the toxins and the aloe vera gel will help the skin not to scar. ALOE VERA: Very effective poison ivy cure! Can penetrate all the layers of your skin and absorb foreign matter within. TEA BAGS: Toss about 20 regular bags of tea in a running bath in the hottest water you can stand. Soak for 20 minutes or more. Don’t rub just soak. Then pat dry with towel. Can then use a blow dryer to help dry the oozy areas. BAKING SODA: Well known poison ivy remedies. Make a paste out of baking soda and water. It will pull the toxins out of your skin. Can also put a ½ cup in a hot bath. BANANA PEEL: Smear the inside of a banana peel on the affected area. Repeat 20 to 3 times a day. *Important: About 15 percent of the 120 million Americans who are allergic to poison oak, poison ivy, and poison sumac are so highly sensitive that they break out in a rash and begin to swell in 4 to 12 hours instead of the normal 24 to 48. Their eyes may swell shut and blisters may erupt on their skin. This is one of the few true emergencies in dermatology says William L. Epstein, MD. Get to a hospital as soon as possible. A shot of corticosteroids will bring the swelling down.